We are now embarking on another journey, one that is the result of a vision God gave to us many years ago ... the building of a new and innovative "House of God". In 2005, God spoke to us and instructed us to begin the process of building a 1,000 seat auditorium. As we began to seek God on this, miracle after miracle began to take place. In late 2006, we began work on coming up with the plans for our new building. I am pleased to report that the plans have now been finalized and we are excited to move forward on the plans for which we will begin our Campaign to build this HOUSE FOR GOD. It will be the fulfillment of a dream and vision God gave us almost five years ago. We are asking that you be a part of this vision. Your contributions towards this mandate will literally change our community, and transform the lives of a generation of people. You can be a part of history! Partner 360° is a movement! It is an ACTIVE partnership between you and your church to attain one goal: creating a center that will be the “jewel” of Oakland! The “Jewel Center” is designed as a 60,000 square foot multi-purpose facility that will house a multitude of businesses, family entertainment options, a youth enrichment center, and a sanctuary for True Vine Ministries. The “Jewel Center” will be built in 3 phases. Phase One will focus on building the sanctuary and the youth enrichment center. We are currently fundraising for Phase One. The name is important. The “Partner” portion is easy – True Vine Ministries is a collective body in Christ (Rom 12:5). The ministry would not exist without the support and participation of you, the member. An effective ministry is one in which the members partner with the leadership to build God’s kingdom. Therefore, we use the term “partner” to emphasize the ownership you have in this ministry. Remember, YOU are the church! Three hundred and sixty are the number of degrees in a circle. A circle signifies infinite unity. There is no break in a circle - no obvious beginning or end. We, as a church family, are unified in this same manner. So “Partner 360°” signifies our unbreakable unity, as partners in Christ and in this new movement for change. Become a part of the Partner360 movement! There will be several fundraisers you can support throughout the year. You may also give a monthly offering above your usual tithe. Consider this: most of us buy coffee or lunch every day. If we saved that money and donated it to the Partner 360° campaign we could donate an average of $100/month! One sure and effortless way to participate is through eScrip. With eScrip you can earn money for your church just by doing your usual shopping. Log onto www.eScrip.com click on True Vine Ministries-Oak and register. Help us reach our goal! Everyone!! 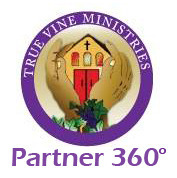 Even the youngest members of True Vine can be 360° partners! We encourage you to also invite your family, friends, and co-workers to join our movement to build the “Jewel” of Oakland! Partner 360° – Are YOU a Partner?